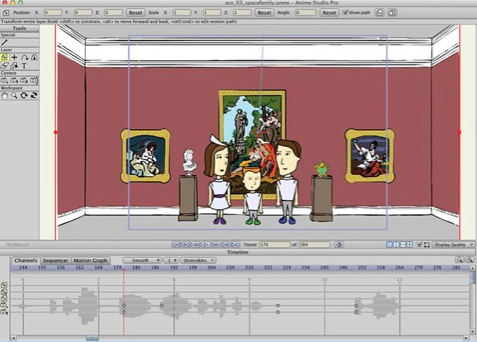 Brinker: Over the past month and a half, Erica Wong, Lead Graphic Designer, Fine Arts Museums of San Francisco, and I have been working on a 2D animation about the conservation of art in a museum.We quickly learned that this project would not only take coordination, but more importantly, it would take a lot of collaboration and teamwork. To begin, we met for coffee and brainstormed ideas for a two-minute animation. We chose to focus our script concept on a superhero conservator who combats time, dust, and pollution in order to save important works of art for future generations.We then approached our very own super conservator, Lesley Bone, head of objects conservation, to get her advice, and record her voice for the audio in the animation. We even modeled our main character after her. Once this was complete it was now Erica’s turn to start making illustration magic. Erica: I started off by breaking down our script into scenes for the storyboard. We had a second brainstorming session about the scenes, which gave me direction in sketching out our ideas. There were objects, props, and backgrounds that I knew were pretty detailed, so I took some photographs for reference, such as the Legion of Honor conservation lab. 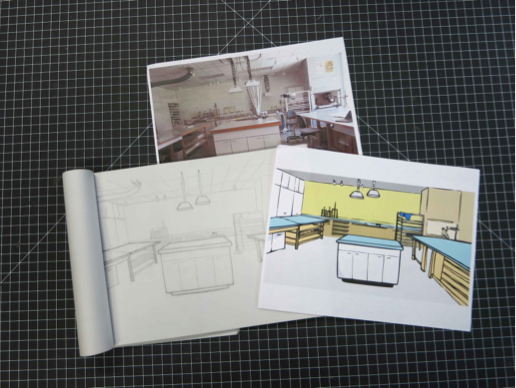 I drew the conservation lab using pencil and vellum paper. Next, I scanned it and then converted the illustration into vectors. For the characters, I drew a few sketches, fully developing them in Adobe Illustrator. From there, I refined and colored the illustration using Illustrator and a Wacom tablet. After compiling all the illustrations, Brinker and I reviewed the storyboard, and she gave me feedback and tips on illustrating the characters in preparation for animation. I have a background in print design so illustrating for animation forced me think differently about how to compose drawings using Illustrator. Brinker: Now it was my turn to start animating. After I received Erica’s drawings my first step was to organize and import them into the animation software. For this project we decided to work with Anime Studio Pro. Using Erica’s storyboard as reference, which was incredibly helpful for audio timing, I broke down each scene including the correct backdrop, characters, and props. Then I began rigging each character. In the video below, you can see how I did this Once this process was complete, I could finally start animating. I like to think of animating as similar to how Charlie Chaplin acted in one of his silent films. He was famous for giving the viewer a split second of anticipation (preparing the audience for his action), exaggeration (action that emphasized his most important point) and finally, follow-through (visually explaining to the viewer what he just did). These three steps combined with “secondary action” or actions like whistling or blinking add a more nuanced feeling to the character and help it come alive. Erica: Collaborating with Brinker was fun and a great experience. It was rewarding to see how someone could take your work to another level and bring it to life. We were able to exercise our skills, learn something new, and collaborate with one another. It is really wonderful thing to see an idea realized through animation. We both look forward to more animation opportunities at the museum in the future.